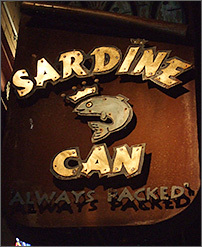 The Sardine Can's motto is "Always Packed" and it seems to be true. This neighborhood bar is full of beer, people, and a good time. The sardine can is always a great place to hang out. It is awelcoming to everyone. The bar tenders, and bouncers are a lot of fun and the drinks are affordable. Great place to be on almost every night. My only complaint is that it doesn't except credit/debit cards but there is an ATM available inside. Holidays are nice, but so hectic at the same time. I needed to catch a breath and unwind one night just before the 25th. Recently, I heard this rumor... maybe I shouldn't call it a rumor, it's more like a fact. And in this said fact, a man can drink a beer through his nose. I would say that's a load of bull but in my sorority days I witnessed a frat boy shove a metal chain in his nose and cough it up in his mouth. Gross, yet very intriguing. Sigh, the passions of young love, we dated for two weeks. Where was I? Oh yeah, if you look on the Sardine Can's website you can see the owner, Chris Hansen, drink a beer through his nose on the Letterman Show. And it's not like he took a quick sniff, he actually finished his glass of beer. I think if we were in a chugging contest, me drinking the regular way and him his nose way, he might still beat me. Bravo. In case you're a little slow, like I am at times, my partner in crime and I headed for the Sardine Can, where it’s "always packed." Packed full of what we were going to find out. There is metered parking lining the streets but if you arrive after 6PM, you car can hang out for free. 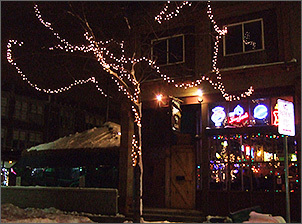 The Sardine Can had all its cheery holiday lights on and the heat turned up to make the bar feel nice and cozy. The bar itself was packed. The slogan wasn't lying. I went to the bar and ordered drinks while my girlfriend sat at a table. When ordering a Bud Light I was caught off guard by being asked if I wanted it tap or can. I chose tap and then asked why they serve CANS and not bottles at the Sardine CAN. You know when it takes you to say something out loud in order for you to understand and then you wish that you could have just said it in your head and figured it out? Well, that's me. I have to ask the lame questions out loud in order to realize what the easy answer is. Of course they serve canned beer at the Sardine Can! At least the bartender was nice and just smiled when I got red in the face and stammered out never mind. Another little fun fact, the pint glasses are hard plastic. It looks just like glass but not as heavy and way more shatter proof. 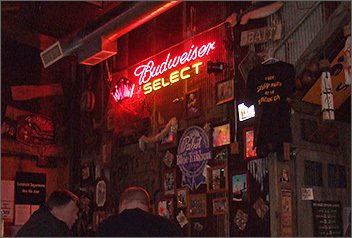 On tap they also have Miller Light, New Glaurus, Blue Moon, Fat Tire, Leinie's Red, Schlitz and something else. But in my embarrassed state I forgot the last one :) One Bud Light and one Leinie's Red ran $5. Nice, huh? A sign inside says the cans were $3. And they only accept cash, but no worries, there is an ATM inside. The Sardine Can is full of things to look at on the walls. There are loads of pictures, beer signs, fishing, and boat paraphernalia. Look up at the ceilings too, there is this leg dangling down to where it looks like a poor unfortunate soul was walking on the roof and got caught. I thought it was pretty cool. If people watching is your thing then you’re in luck, there were plenty of people to scope. Also, a few bras were scattered over the bar, but not as many as Billy Goats, come on Sardine Can, you're slackin'! They had the music blasting and everyone looked to be having a good time. It's impossible to sit there bored. They also have a patio but it might be a tad too chilly to enjoy for the next, oh I don't know, four months.